Divorce turns the life of parents and children topsy-turvy. There are new living arrangements and different schedules to abide by, all while adjusting to the emotional transition of a family that was once whole splitting into two. It's important to focus your attention and efforts on maintaining a strong relationship with your kids during this time—as old routines give way to new ones and a new family structure emerges. It's easy to fall into despair, become engulfed in anger or consumed by frustration—but channel these toxic thoughts into one primary goal: being an amazing divorced dad. You will not only feel more empowered and energized, but you will be building a lifetime bond that will outlast the temporary pain and regret of the dissolution of your marriage. Your job as dad is lifelong, and of vital importance and benefit to the healthy development of your children's well-being. This may seem easier said than done, but having a plan makes sticking with your goal to stay connected to your kids manageable. Again, this may be difficult, especially at first when emotions are running high and the wounds still fresh. The strategy that works best is redefining your relationship from that as ex-spouses into a new relationship as co-parents. Shifting the focus to your mutual goal of serving the best interests of your kids allows you to stop rehashing the past relationship you both shared as husband and wife. Leave the conflicts, whether unresolved or not, by the wayside. Redirect your communication with the mother of your children to issues that directly impact the monumentally important job you share—raising kids. The benefits will be abundant, easily outweighing the effort it takes to let go of past injuries and facilitate a parenting partnership. 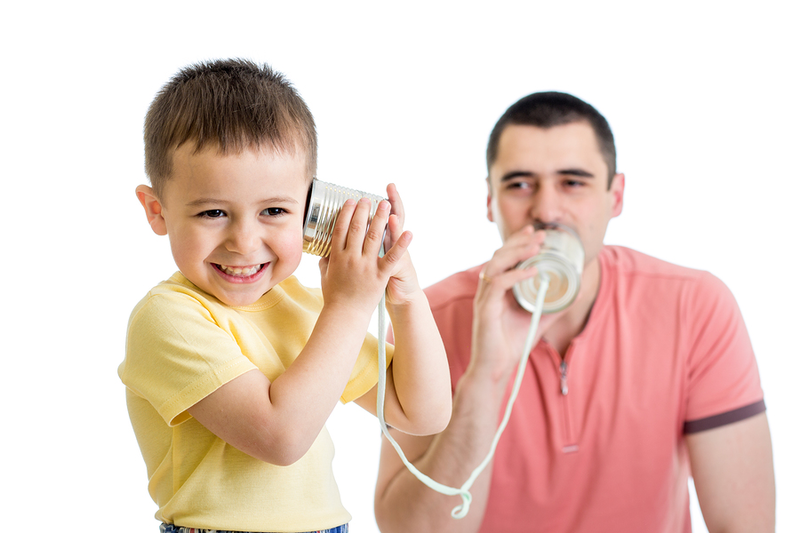 With open communication you will be informed of what's going on in your kid's lives when they are not with you. This really counts when it comes to things kids will be reluctant to tell you themselves, like slipping grades at school or problems getting along with their siblings at home. The less conflict you have with your kids' mother in front of them the better adjusted they will be. They will be stressed if pick-ups/drop offs are mired in arguments, or worse, put downs and accusations. Make the most of your time with your kids by focusing on them and you will create wonderful memories and nourish a loving bond instead of fueling emotional turmoil. Studies of divorce and children conclude that children tend to have higher self-esteem and stronger social and coping skills when there is less conflict between parents. Just as your relationship with your kids is of primary importance for your kids' healthy development, they need their mother and love her too. If you talk down to her in front of your kids or speak badly about her to them it will damage them in ways you never intended and you may not realize. When you make a commitment to your kids, be like the mail man…and deliver. This builds trust and respect, which are the foundation of any relationship. Have space that is theirs at your house so they feel comfortable and welcome. If your living situation doesn't allow for them to have their own room, you can give them an area where they put their clothes and toys and gadgets when they come over that is distinctly theirs. This builds a feeling of belonging and safety that they have a place in your new life. Commit to enforcing the same rules regarding practices like homework and bedtimes, this is especially true for younger kids who benefit from the security of clear, steadfast boundaries. When parents hold a unified front across separate households, children know what is expected of them and can focus on meeting those expectations—instead of trying to exploit the situation to get away with behavior they know is unacceptable in either household. It's ironic that with the emotional turmoil surrounding custody negotiations and not seeing your kids as much as before, that it's easy to forget to fully enjoy the time you are spending with them. Being stuck in the way things used to be or we wish they had turned out can rob us of being in the moment and experiencing the joy of now. Being a dad is one of life's most rewarding pleasures—get the most fun and laughter these times have to offer. Do activities together. Be ready with open arms for a hug, fist bump or pat on the back. Share funny stories, watch funny movies and lose yourselves in silly play time (whether it's video games, board games, running through the sprinklers in the backyard or trips to the park). Make your home a place where good feelings and good times are easy to share and indulge in. Thinking back, some of your most meaningful memories are likely team championship games, school plays and awards ceremonies. Your kids will look back on these same events and relive them long into their adulthood. Be a part of these special experiences by attending all the spelling bees, sports games, debates, math club and martial arts tournaments, recitals and performances you can. And take lots of pictures so you can create albums you can share with your kids for years, and maybe one day share with your grandkids. This is another reason to go the distance to establish good communication with your kids' mother, since she can be a valuable source of information about what is occurring, both at school, afterschool and with their friends. Insist your kids show you all report cards and when possible ask if you can help take them to after school activities. Talk to them about their interests so you can share in them (if you have a comic book fanatic on your hands, take trips to comic book store and watch the latest super hero movies, if you have a budding guitarist in your midst, go see a concert together). Be supportive of those things that are important to them and they will let you in. Stamp collecting, racing bikes, ice skating or singing—encourage your kids' passions and you will always have something to bond over. We know peer groups leverage heaps of influence on kids' lives, so it's smart to find out who your children hang with. Have them invite friends for outings to the amusement park or to the lake or the fairgrounds. The more you know about your kids' lives the more you can help guide them toward their best possible futures. Go back ten years and the lack of resources for parenting information and support for dads would leave you feeling frustrated, but today there is a goldmine of support groups, blogs, tools and books at your fingertips. A quick search on Amazon will yield titles like Divorced Dads: 101 Ways to Stay Connected with Your Kids (Staying Connected), Wednesday Evenings And Every Other Weekend: From Divorced Dad To Competent Co-Parent and many more. The ubiquity of technology in our everyday lives can make it a difficult to drag kids off the computer or phone…so use it to your advantage. Schedule Face Time chats via your daughter's smartphone or Skype using your son's webcam. Texting, email, and messaging apps are all ways today's digital savvy youngsters love to communicate, so meet them on their preferred devices and platforms to stay in touch. There is a silver lining to dealing with the issue of staying connected with your kids across separate households. Many parents are blindsided with the distance that develops when their kids move away to college or out on their own. Once children become young adults all parents must deal with the reality of trying to retain a strong bond with children who are no longer living with them. As a divorced dad you will already be a pro at remaining close to your kids despite distance. You'll be ahead of the game! This article was written by Sara Gabriella. Sara covers topics relevant to the modern divorced man and father for Guyvorce.com.